"A Captivating Romp of a Novel"
When Constance Kopp and her sisters suffer a run-in with a ruthless, powerful crook, Constance leaves her quiet country life to team up with the local sheriff and exact justice. As a war of bricks, bullets, and threats ensues, Constance realizes that this racketeer's history may be more damning than she thought, but now that she's on the case--he won't get away. Quick-witted and full of madcap escapades, Girl Waits with Gun tells the true story of one woman rallying the courage to stand up for and grow into herself--with a little help from sisters and sheriffs along the way. Meet the real Constance Kopp and the other people that inspired Girl Waits with Gun. See what life was like in the Kopp's New Jersey--and read their press clippings. Download fact sheets, Q&A, and other press kit materials. I've got cocktail recipes, a Q&A, and details on webcam & phone visits for book clubs. "Stewart has spun a fine, historically astute novel... The sisters’ personalities flower under Stewart’s pen, contributing happy notes of comedy to a terrifying situation... And then there is Constance: Sequestered for years in the country and cowed by life, she develops believably into a woman who comes into herself, discovering powers long smothered under shame and resignation. I, for one, would like to see her return to wield them again in further installments." "An entertaining and enlightening story of how far one woman will go to protect her family...a tale that’s as much the story of a woman who refuses to be bested by a bully as it is a chronicle of the social restrictions placed on women at that time." "The Kopps are the stars of Stewart's new zippy, winsome novel... Filled with historical detail without being weighed down by it, the novel is a cinematic story of the women, the siege instigated by their powerful enemy, and their brave efforts in the face of real violence." "In her engaging first novel, Stewart (The Drunken Botanist) draws from the true story of the Kopp sisters (Constance became one of the country’s first female deputy sheriffs) and creates a welcome addition to the genre of the unconventional female sleuth. Colorful, well-drawn characters come to life on the page, and historical details are woven tightly into the narrative. The satisfying conclusion sets up an opening for future Constance Kopp novels." "Hardened criminals are no match for pistol-packing spinster Constance Kopp and her redoubtable sisters in this hilarious and exciting period drama by bestseller Stewart (The Drunken Botanist). This is an elegant tale of suspense, mystery, and wry humor...An exhilarating yarn. "A sheer delight to read and based on actual events, this debut historical mystery packs the unexpected, the unconventional, and a serendipitous humor into every chapter." "A smart, romping adventure, featuring some of the most memorable and powerful female characters I've seen in print for a long time. I loved every page as I followed the Kopp sisters through a too-good-to-be-true (but mostly true!) tale of violence, courage, stubbornness, and resourcefulness." "Stewart crafts a solid, absorbing novel based on real-life events—though they’re unusual enough to seem invented...Stewart deftly tangles and then unwinds a complicated plot with nice period detail...More adventures involving gutsy Constance, quietly determined Sheriff Heath, and a lively cast of supporting characters would be most welcome." "It's set in 1914, but its heroine, Constance Kopp, feels about 100 years more modern as she boldly takes on a gang hellbent on destroying her family." "100 years ago, Constance Kopp was well on her way to becoming the baddest chick in the West." "A great example of early 1900s girl power...I can't help but praise Stewart not only for how she fleshes out the events in this story, but also for the way she brings to life these highly unusual sisters and the times in which they live." "Critics are hailing this edge-of-your-seat romp as another bullseye for bestselling author Stewart, and the Internet is abuzz with anticipation. Gunslinging gangsters, loads of dry humor, and a passel of no-nonsense, pistol-packin’ women round out this fiery tale, which promises to deliver on its ample fanfare. " "Through painstaking attention to detail, Stewart has created an elegant, moving narrative of an unusual real-life woman who dared defy the odds to ensure the safety of her family." "A marvellous romp ... Stewart’s declarative, efficient sentences successfully convey an early 20th-century style without ladling florid prose on to the plot’s high drama." "Stewart gives us three sisters whose bond — scratchy and well-worn but stronger for it, as can happen with family ties — is unspoken but effortless. Girl Waits with Gun might sometimes be a story in which truth is stranger than fiction, but it also makes for pretty charming fiction." 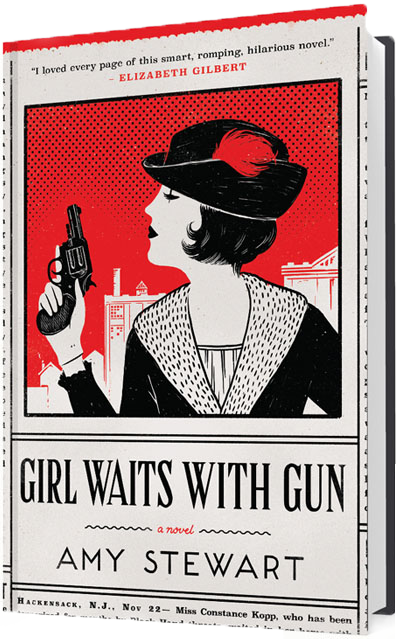 "Girl Waits with Gun spins the alternately tense and rollicking tale of how New Jersey spinster Constance Kopp confronted the alarming lawlessness of a World War I-era silk mill town and won the job that earned her a footnote in history... Girl Waits with Gun mines the life of Constance Kopp and the fascinating, riveting, and almost-lost sliver of history that bears her stamp." "Amy Stewart tells a tale as captivating as it is genuinely funny in its portrayal of three bewildered sisters who find themselves in a war with one of the most powerful men in their hometown... The book is awesome, period. Hollywood could learn a thing or two." "Well-written with sharply drawn characters and the occasional plot twist, 'Girl Waits With Gun' is an absorbing throwback to a bygone era." "A confident, charming, sure-footed debut — a fresh, winning and delightful mystery with a warm heart, impish humor and a heroine who quietly shatters convention." "Constance Kopp could be just the leading lady Hollywood has been waiting for." "[Stewart has] created several memorable characters here, in particular Constance, who, enterprising and independent but with a closely guarded sorrow in her past, seems like an American answer to Maisie Dobbs." "Among the most appealing crime novels recently published...Girl Waits with Gun is smart, funny, and suspenseful. Beyond entertaining us with a rollicking plot and colorful characters, Stewart allows us to witness the personal transformation of an extraordinary woman forgotten by history." "Girl Waits with Gun is fresh, funny and utterly compelling - and Constance Kopp and her sisters are not just great investigators, but completely original women. It was a blast from start to finish and I can’t wait to see what Deputy Kopp gets up to next." "Let me scream my jubilation here: Read this book! It has that luscious feel of history improved upon. The Kopp sisters easily could have been a footnote in history, were it not for Stewart's painstaking research and fine flair for building a story." "An invigorating read...It’s odd to describe a book with such a clear dichotomy of good and evil, in which chaotic violence and wanton tyranny abound, as charming, but from the very first page, that’s exactly what it is." "Girl Waits With Gun features a heroine to root for and a supporting cast so strong any one of them could stand alone...This book thrums with the best kind of girl power: no gimmicks, no clichés, no recycled plotlines, just a rollicking tale."